Garrick Palmer is a painter, printmaker, illustrator and teacher, born in Portsmouth in 1933. He studied at Portsmouth College of Art and Design and then did a post graduate course at the Royal Academy. Palmer was awarded art scholarships including David Murray Landscape Scholarships, the Royal Academy Gold Medal and the Edward Scott Travelling Scholarship. He started his teaching career at the Winchester School of Art whilst he was still a student at the Royal Academy, later becoming a full time tutor in 1962. By 1966 is the Head of the Foundation Department at Winchester. It was in 1967 that he received his first commission from the Folio Society to illustrate books. Since then he has illustrated numerous books with fine wood engravings. He retired from Winchester School of Art in 1986 and devoted himself full-time to his art. His work was shown in an “Exhibition of Wood Engravings used as Book Illustrations”, at Oxford University Club, Halifax House, Oxford and he participated in the “Society of Wood Engravers Touring Exhibition”. In 2012, the Society of Wood Engravers awarded its 75th Anniversary Prize to Palmer for his wood engraving , “Circular Forms“, which exists in several editions. 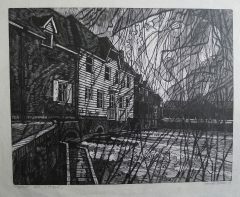 He is a Fellow of the Royal Society of Painter-Printmakers (retired), the Society of Wood Engravers associate of the Royal Engravers, the Royal Society of Painter-Etchers and Engravers (retired), and the Royal Society of Painter-Printmakers (retired). His work is held in many private and public collections.